As a California native, dealing with cold temperatures and snow on the ground was not something that came naturally for me, camera in hand or otherwise. But now, as a mom and photographer living on the East Coast where we have very distinct and sometimes severe weather, I’ve needed to learn a few things about taking pictures in the cold Winter months. Keep your camera cold – This tip may sound surprising, but the fact is, taking your camera from the chilly outdoor temps to warmer temperatures indoors (or inside a jacket) can cause your lens to fog up. And, believe me, that fog or condensation WILL show up in any pictures you try to take. Cameras are built to function properly in freezing temps, so keep snapping away! Bring extra (warm!) batteries – Cold batteries drain more quickly than warm batteries, so keep some spare batteries close by (stick them in your pocket, and they’ll stay plenty warm!). Keep your camera and lens dry – it’s tough to catch snowy action shots while protecting your camera from all the falling moisture, but it’s there are a few steps you can take to protect your camera to ensure good shots. The simplest solution is to carry an umbrella to cover yourself and the camera from snowfall. If that doesn’t work, you can either purchase a rainsleeve for your camera model OR make a simple covering with a plastic bag and rubber bands (I think I may need to create a tutorial for a DIY rain and snow cover!). If all else fails, look for a covering (tree, porch, etc) to stand underneath and use your zoom! 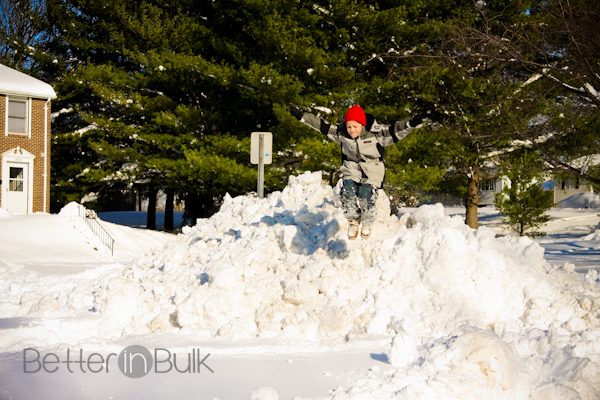 Use fill flash – Sometimes the bright, white snow can be blinding to the eye and produce bright, washed out photos or subjects that are not properly exposed. 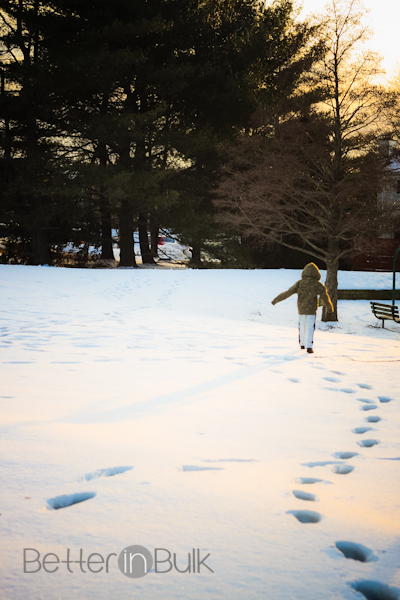 It seems counter-intuitive to use a flash, but the flash actually balances out the sunlight reflected off the snow and fills in darker areas, so your subject will be properly exposed instead of too-dark against the bright snow. Look for lines and shadows – Unlike the sometimes-busy landscapes of the warmer months, snow and ice tend to isolate and make the world a fresh canvas. Footprints and shadows stand out more than ever, and can become an engaging subject by themselves. 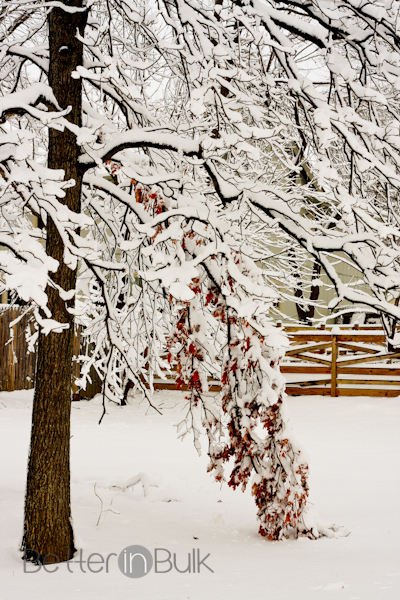 Focus on contrasting colors – colors, whether they are Winter coats and hats on a child or red berries on a bush, are accentuated against the bright whites of snow and ice and can create a very vivid, engaging photos. 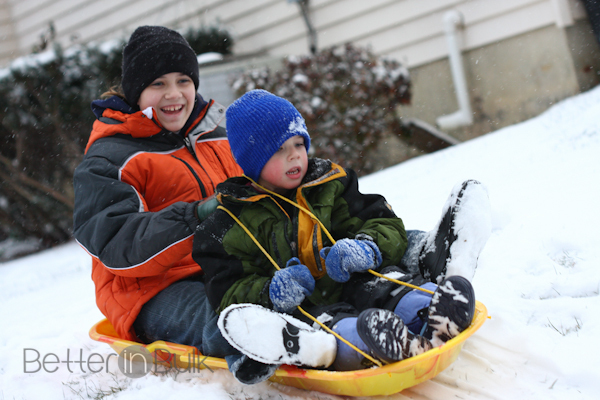 Capture action – Use a fast shutter speed or action/sports mode to catch your kids or pets enjoying the snow…or even to capture the snow as it falls. Winter action shots are some of my favorites. Bundle up….but leave your fingers free – Have you ever tried to take a picture while wearing gloves? It’s not easy. I recommend either investing in a pair of gloves with the fingertips exposed OR bringing along small handwarmers for your pockets. It will make snapping those quick, special moments much easier. Capture the outside…from inside – Sometimes it’s just too cold or wet or snowy to venture outside. 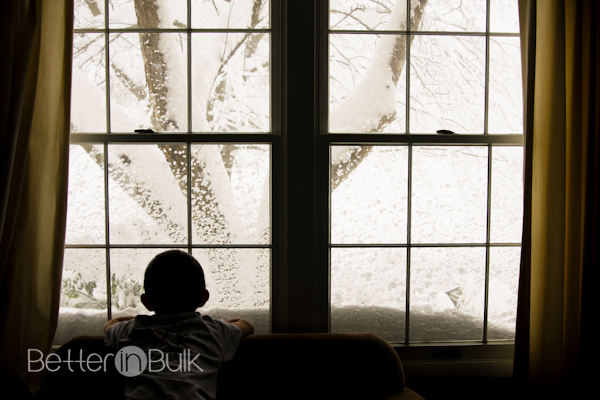 Catch the beauty of the Winter through a window. Just remember to turn the flash off when shooting through a window or else the light will bounce off the glass. 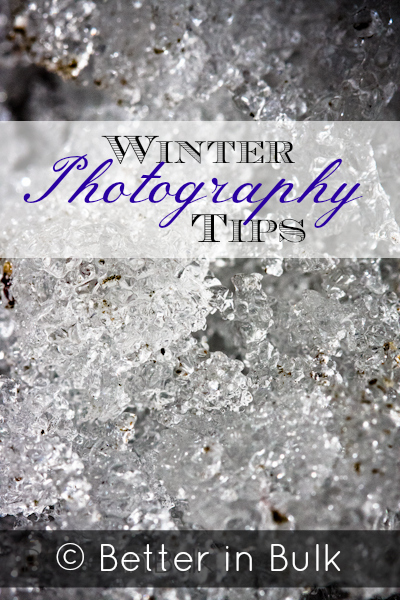 Do you have any Winter photography tips you’d like to share? 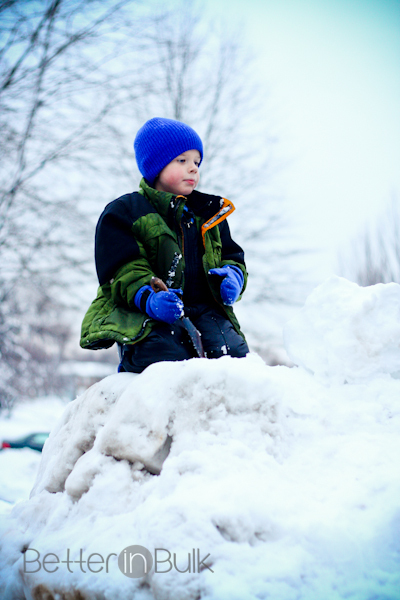 After you’ve captured your best Winter photos and videos, be sure to preserve them for your family by creating a YesVideo DVD to enjoy for years to come. Note: I am a YesVideo Ambassador and receive compensation for my involvement, but tips and opinions are my own. I have visited the YesVideo headquarters, met and spoken with the people that process your family’s memories, and trust and recommend them wholeheartedly. These are awesome tips Lolli! I love the one to look for contrast. It is such a simple tip but it makes a picture pop! Love that one of the footprints. So neat how they help the eyes find the focus of the picture – the little boy! Thank you! I love to use lines to add interest in pictures but it’s not something that I do without thinking, y’know? These are great tips. Never knew cold batteries drain out faster. Believe me, I’ll trade you!